What an incredible picture. One for the living room wall, Moeen. It's been another hugely enjoyable Test match and there is one more to come, starting on Friday at Old Trafford. We are making a couple of changes to our team for that one, just to keep things fresh of course, so join them on Friday morning from 10:15 BST. But from all of us here today, cheerio now. Brian Read: Very well done England, great performance all round! Just don't throw it away in the last match starting on Friday! Josh Roberts: You can excuse inconsistencies when you're in transition. We have an experienced & fairly settled side. Time to be consistent! Email Message: Can't help but think that the game would have been over yesterday if Rashid had been in the team. He is the best in the business at getting lower-order batsmen out. I do hope they restore him to the side asap. His record speaks for itself. Not a bad batsman as well. Would like to know why he was dropped, when England continue to pick players who are clearly out of form or just not good enough. Can't help but think that the game would have been over yesterday if Rashid had been in the team. He is the best in the business at getting lower-order batsmen out. If you want to watch Aggers convincing Geoffrey that one of his hundreds was about to taken from him by the ICC, here is the clip. App users may have to click "View more" to see the above content. Here's the link for FaceBoycs Live...it's your close-up, Geoffrey. Email Message: Re: Four-day Tests - My suggestion would be make it a 400 over game, no overs deductions for change of innings. The game could be scheduled for four days but with a reserve day (the 5th day in the current schedule - so no changes to schedule). The reserve day could be used where 400 overs have not been bowled, due to bad light, weather or slow over rate. This may also encourage sides to bowl their overs in a timely fashion and get a day off. The grounds could bid for the matches on four-day basis - any revenues on day five being a bonus. Re: Four-day Tests - My suggestion would be make it a 400 over game, no overs deductions for change of innings. The game could be scheduled for four days but with a reserve day (the 5th day in the current schedule - so no changes to schedule). More from England coach Trevor Bayliss on Sky Sports: "I'm still of the view we don't need more than seven batters - we've got three guys like Stokes, Bairstow and Ali who give us a lot of options, so we looked at the conditions here and played the extra batsman. 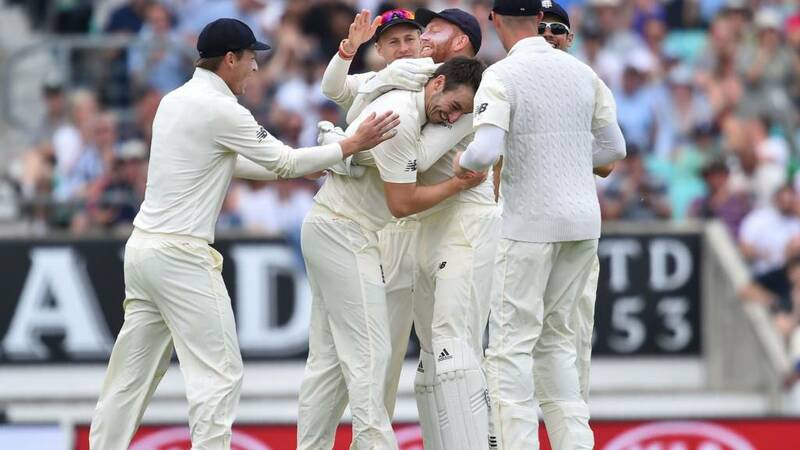 Toby Roland-Jones and Tom Westley were outstanding - we've tried some guys in the past who have done well early on, hopefully we'll be talking like this after 10-15 Tests. Westley's fitted into the squad very easily, looks comfortable around the group. Toby looks like one of his strengths is accuracy - we haven't got the out-and-out pace that Australia have, so you've got to be able to put the ball in the right areas, and Toby's done that." There is a lot of talk about four-day Tests. But surely the fifth day pressure means teams have to play to win in the fourth day. Four days would have rescued SA. A fifth day available impacts the game EVEN when it isn't used. Loads of positives, but I always worry about the England side when we praise them so much - as we have to when they play like this - so let's see how they play at Old Trafford. Cricinfo: The last England spinner before Moeen Ali to take a Test hat-trick: Tom Goddard in 1938. Moeen Ali on his match-winning hat-trick, on TMS: "It's a great feeling to win the game. I was very surprised he gave it not out. As soon as it left my hand I knew it was there or thereabouts, I was pretty confident. "It's brilliant for the crowd and the team to finish like that." On the plan for Old Trafford: "Win the toss and bat hopefully. Obviously in Manchester we need to put a massive emphasis on starting well." England coach Trevor Bayliss on Sky Sports: "Quite honestly, Mo probably believes he's bowled a bit better than that in the past. If we're winning one and losing one, it means other teams are going through the same. It's on us now to back that up and win in Manchester. The guys copped a bit of criticism for the way we played in the last game, we had a chat about it between Tests. Somewhere along the line, they've got to take responsibility for the way they've played - Stokes had a good game plan, watching and leaving, and when the bad ball came along, he was ready to put it away." Tony Bickley: Surely that shows who our number one spinner is? If Dawson had been picked then he'd have probably been given the ball over Ali. There is going to be a special post-match FaceBoycs Live on the TMS Facebook page so get your questions ready. England seamer Toby Roland-Jones would have won the magnum and the cheque on most occasions for match figures of 8-129 and 48 runs with the bat. Here he is on Sky Sports: "It's been draining at times, but to be part of the last five days and win in the manner we have, it couldn't have been better. Certainly the conditions helped the seam bowlers like myself in the first innings. It's strange to have three guys in the same innings on a hat-trick - Stuart Broad had a few things to say about what it's like to get a Test match hat-trick." England's hat-trick hero Moeen Ali on Sky Sports: "I was very confident it was out, as soon as it hit his pad! It was a great feeling. Aleem Dar gave me the ball so I put it straight in my pocket." How about this for a stat, Moeen's hat-trick is the first in Tests where the three batsmen have all been left-handers. Superb stuff. England captain Joe Root on TMS: "It's been a really good week, the way we played was fantastic. We found a really good tempo and need to look to emulate that moving forward. "The way we played was brilliant. You look down the side and there's a number of different match-winners, so if we can get in a position of strength early on then we can get across the line. "The most important thing was responding positively after last week, it shows the character of guys in the dressing room. "It's all about going one further and making sure we finish the Test series in Manchester."